, so you can ask it to assist you with whatever you’re doing—right in the moment, anywhere on your phone. With “Now on tap,” you can simply tap and hold the home button for assistance without having to leave what you’re doing—whether you’re in an app or on a website. For example, if a friend emails you about seeing the new movie Tomorrowland, you can invoke Google Now without leaving your app, to quickly see the ratings, watch a trailer, or even buy tickets—then get right back to what you were doing. If you’re chatting with a friend about where to get dinner, Google can bring you quick info about the place your friend recommends. You’ll also see other apps on your phone, like OpenTable or Yelp, so you can easily make a reservation, read reviews or check out the menu. When you tap and hold the home button, Google gives you options that are a best guess of what might be helpful to you in the moment. But if you need something specific, you can also get Google to help by saying “Ok Google” from any screen, and any app. For example, if you’re listening to Twenty One Pilots on Spotify, you can say “Ok Google, who’s the lead singer” and get your answer right away. As you’ve seen across these examples, Google can show you apps from your phone that may help with what you’re doing based on your context—IMDb for movie reviews, OpenTable for reservations, and many more. This is another way developers can get their apps in front of their users at the right moment, when an app is relevant to the task at hand. And best of all, developers don’t need to do anything to integrate with Now on tap as long as they have their apps indexed by Google. We hope Now on tap can make your phone a little bit smarter and help you get things done quicker and in far fewer steps. 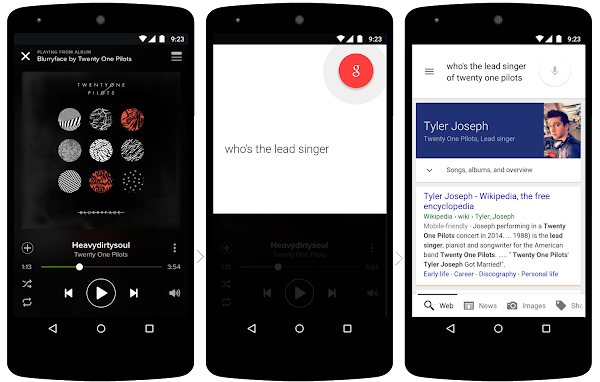 We’ll be sharing more details about all this as we get closer to the release of Android M.
Your mobile phone does wonderful things for you, but it’s still not always easy to find a quick piece of information or get something done on the fly while you’re in the middle of something else—like listening to music, texting your friends, or reading your email. Too often, you have to leave what you’re doing just to look for what you need somewhere else on your phone. 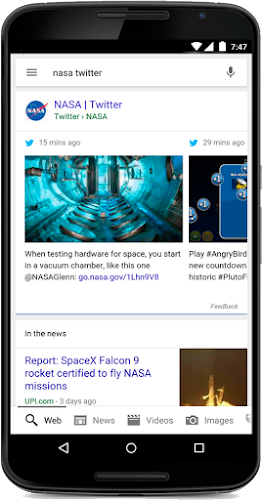 Making it easy to find what you need is core to our mission, and today at Google I/O we previewed Google Now enhancements to help remove some of this hassle. 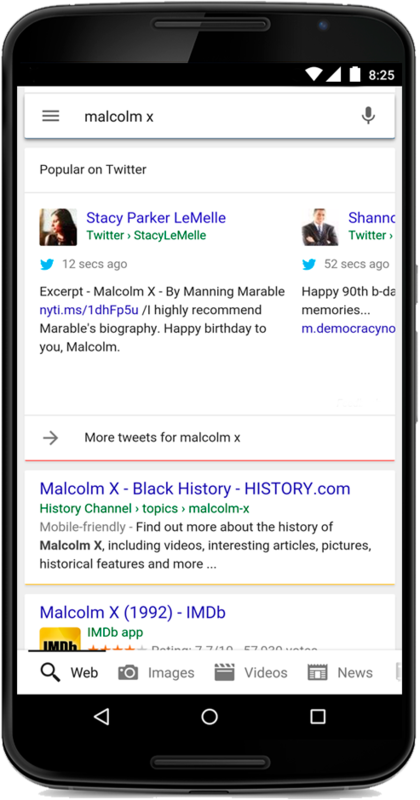 Since we launched Google Now, we’ve been expanding the ways it can help and do more of the work for you. You can get notifications like where you parked your car, news stories based on your interests, or help with travel like your upcoming reservations. We’ve also gotten better at giving smarter answers to some of your questions (“Is my flight on time?”) and at helping you get things done across your apps (“Ok Google, play Sugar on Spotify”). 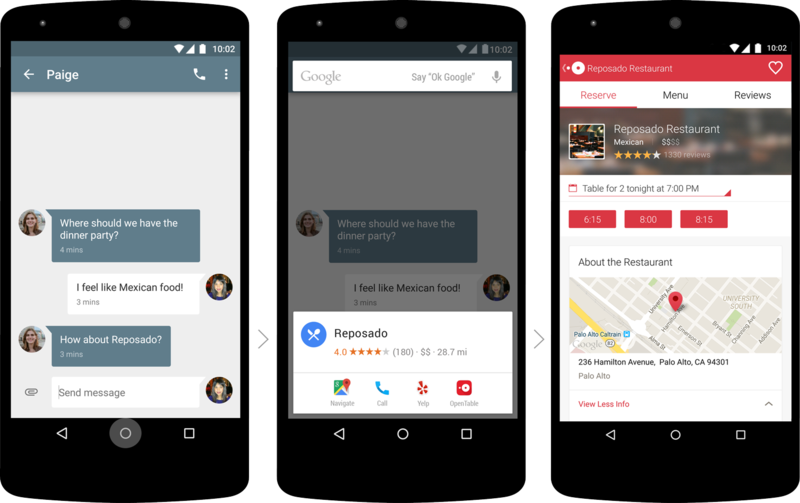 We’re working to make Google Now a little smarter in the upcoming Android M release, so you can ask it to assist you with whatever you’re doing—right in the moment, anywhere on your phone. With “Now on tap,” you can simply tap and hold the home button for assistance without having to leave what you’re doing—whether you’re in an app or on a website. 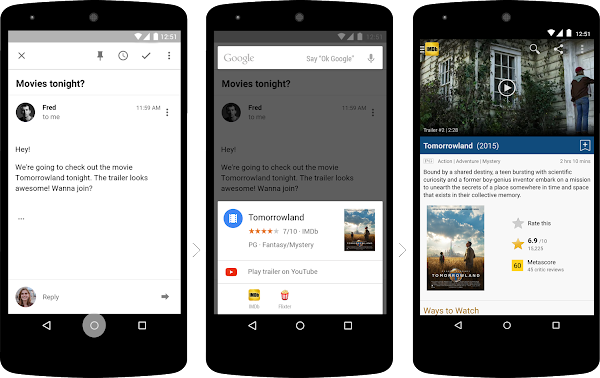 For example, if a friend emails you about seeing the new movie Tomorrowland, you can invoke Google Now without leaving your app, to quickly see the ratings, watch a trailer, or even buy tickets—then get right back to what you were doing. 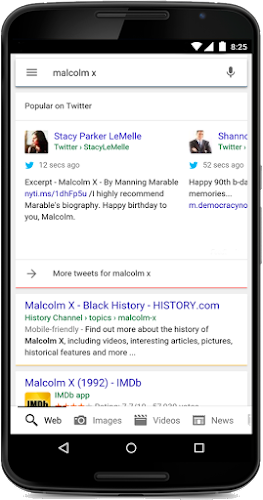 Or if you heard today was Malcolm X’s birthday, you can ask the Google app and see what various people and organizations in the Twitter community are saying about it. 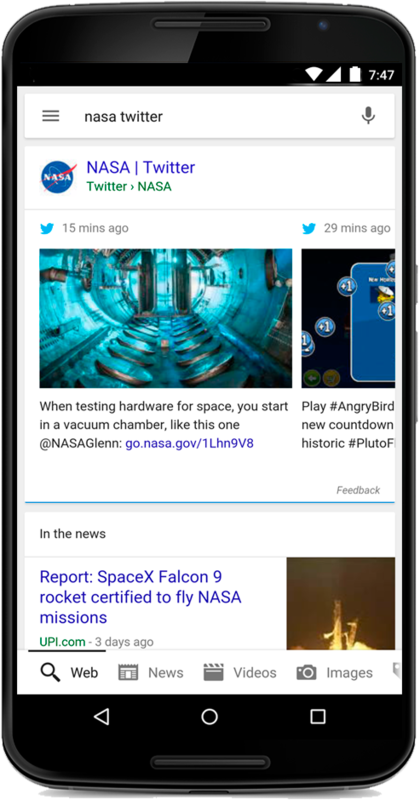 To start, we’re launching this on Google.com in English in the Google app (on Android and iOS) and on mobile browsers, rolling out gradually. We’re working on bringing it to more languages and to desktop, so stay tuned.